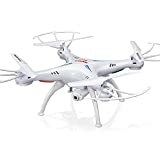 Syma X8C Venture with 2MP Wide Angle Camera is a small, lightweight Quadcopter recommended for all those people who wish to learn and watch their multirotor drone do wonders in the sky. The appreciably built quadcopter has been much loved by the quadcopter lovers’ right since its launch in the market. The price that it is offered at, the product is a real steal. The camera is an added benefit and allows you to capture images as well as videos and store it on an SD card. What can you find in the Box? 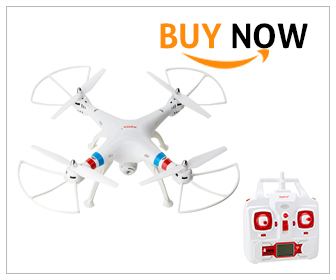 The package comes with a white colored Syma X8C Venture quadcopter that has a 2MP wide angle camera. The box also contains 4 pieces of rotating blades, 4 protection frames, 4 landing gears, remote control, 1 USB Charging Cable, 1 4G Memory Card, 1 Card Reader, 1 Screwdriver, one 7.4 V 2000mAh Li-on Battery and 1 user manual. The Syma X8C Venture is equipped with an Intelligent Orientation Control System also known as IOC. This means that the onward direction of the quadcopter is similar to that of the direction of the nose. With this function, the forward direction of the multi-rotor has got to do nothing with the nose direction. This implies that the steepness of the learning curve would be lessened which gives the pilot the chance to enjoy the whole flight while slowly getting to learn each and every specification of the quadcopter. The Syma X8C Venture is also equipped with the modern 6-axis flight regulation systems, additional scheduled flight, 3D Lock as well as performing more to the force. The colorful flashing lights are also a great way to keep your child engaged. The 2MP built-in HD Camera in the quadcopter gives you the opportunity to take pictures and film videos while flying. This means that you can now take pictures from several aerial viewpoints while flying your toy. The quadcopter also comes with blade protectors which help in providing additional protection to your blades from any sort of minor wear and tear while they are in the air. They can even protect your toy from minor crashes. The 360-degree eversion aids in a continuous roll for that ideal action and marvelous performance. By charging it once, you can fly it approximately for an impressive five to eight minutes after which you would need to charge it again. Detailed instructions in the manual can help you in assembling all the parts and flying it efficiently. The product comes at an impressive price of under $70 and has free shipping at Amazon stores. Lightweight, easy to use, this is a great product for your kid if he/she is interested in learning to fly and operate quadcopters.